A collection of art and descriptions created by Jimmie Bartlett. 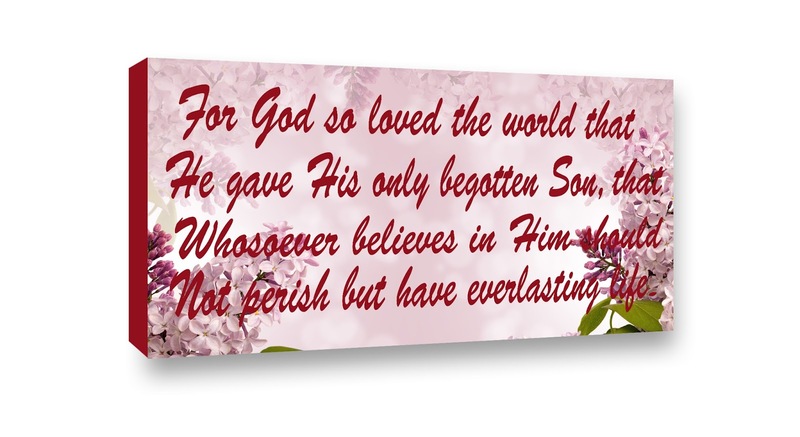 I have always enjoyed these Christian scriptures found in the Bible and in music, so I have made some canvas art signs (using digital art) of my favorites to put in our home and on our website www.bartlettpairart.com. 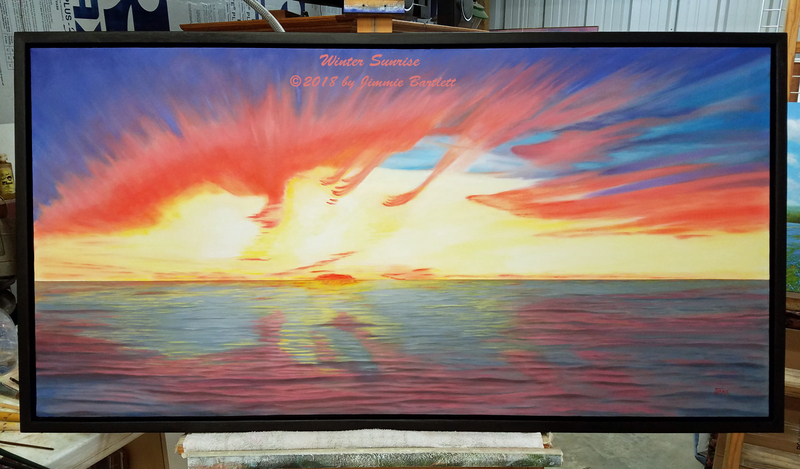 I finally got a good picture of my newest painting today and I changed the name to Sunrise Over Matagorda Bay. (Check out my previous post of the work in progress of this painting). 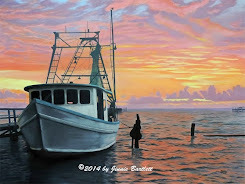 I changed the name because during the painting sessions, I was thinking back to the many fishing trips my friends and I had on Matagorda Bay. When out on the water, with the sun breaking through the darkness, one cannot help but feel the excitement of a new beautiful day being born! 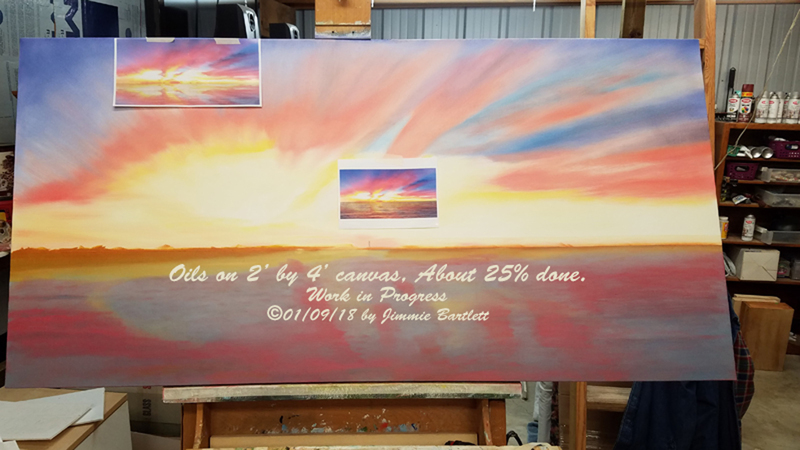 The canvas is 2 ft. by 4 ft. a perfect match for the panoramic view. I had already painted in the first layer for the sunrise before deciding to use it for a WIP. The second picture shows a base of light to dark greys for the water in the foreground. The horizon has to be perfectly straight and should not placed in the middle. I used masking tape and measured to make sure the tape was straight. In the next picture, the reflected sky colors are being laid in over the gray base for the water. Note the reflections are mirror images of the sky. The painting is starting to resemble some reality. Two reference photos are used to paint from: one larger and one smaller with different exposures to see what looks best for the work. In the below picture, wave movement has been added to make the water come alive. Here, blending a darker gray for the wave shadows can be done on the palette and on the canvas. More color is needed in the water and will be added in the next session. 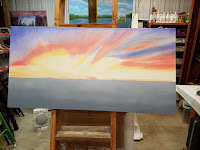 While the water section is drying, work on detailing the sky shapes and colors will be done. I plan to add more pictures as the painting progresses, so check back in a few days if you want to see what happens. 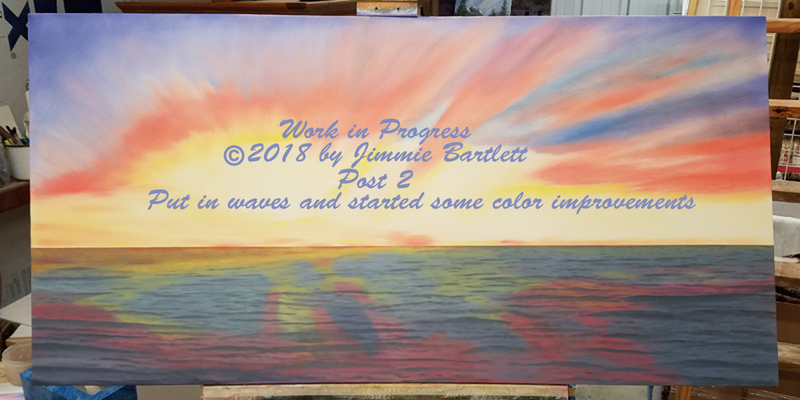 Another great day at the easel with more progress made. Take a look at the below picture to see the changes in color intensity which is a result of adding more layers and finding things to improve and correct. 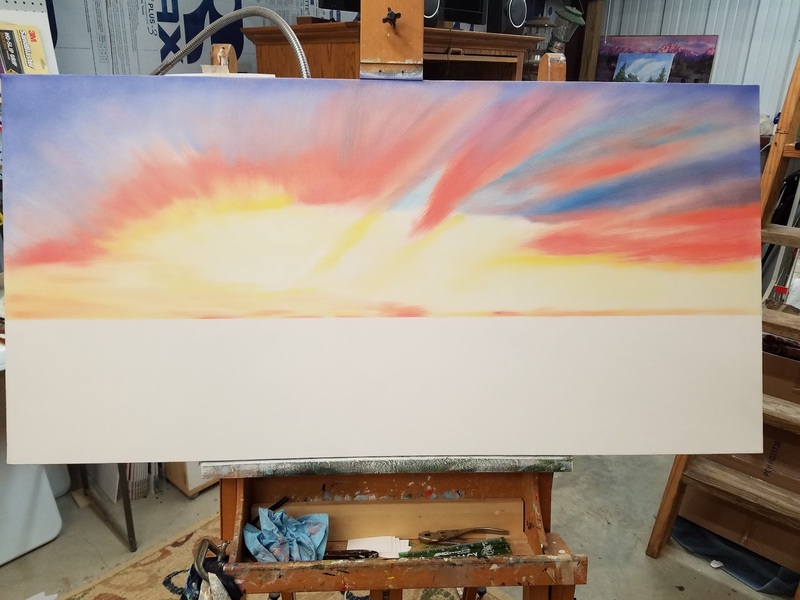 The rising sun is to the left of the painting's center and creates a brighter gradient on that side vs the right side of the canvas. A nice effect. I will be painting more this weekend and hope to have another update posted. I hope you find this WIP interesting and helpful. 02/02/2018 I finally finished the 'Winter Sunrise' oil painting today. It took a bit longer than expected. The photo is a cell phone snap shot. I am hoping the weather will let me take printable photos tomorrow. 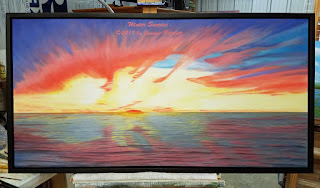 The painting is 2 by 4 foot and mounted in a black custom built floater frame. The palette consisted mainly of the primary colors mixing with white and payne's gray to obtain the varied intensities of light and colors. The main chore was to obtain the harmony of reflected light on the water with the colorful sky. I also deviated from the reference photo to make the painting more believable and easier for me to paint. Actually, I used two references to create the painting: a photo for the sky and another for the water. I pasted the water from one photo under the sky of another to create the refence seen in the work. Probably why it took extra time to finish. This painting brought back memories of my youthful days in the navy looking out over the expanse of the ocean and how clear the skies are there. Also, the many great fishing trips, when we left before daylight, to fish offshore or in West Matagorda Bay. I hope you have enjoyed the posting of a work in progress. 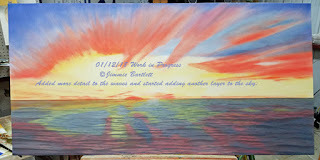 I would appreciate your comments and especially if you would like to see more work in progress postings. 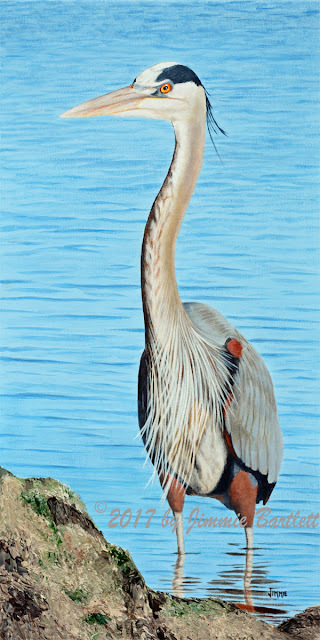 I decided to change the name of American Eagle No.2 to Eagle Eye as it is more fitting for this painting. (changed 9/12/17). Eagle Eye is an original oil painting on a stretched 8 x 10 inch gallery wrap canvas. 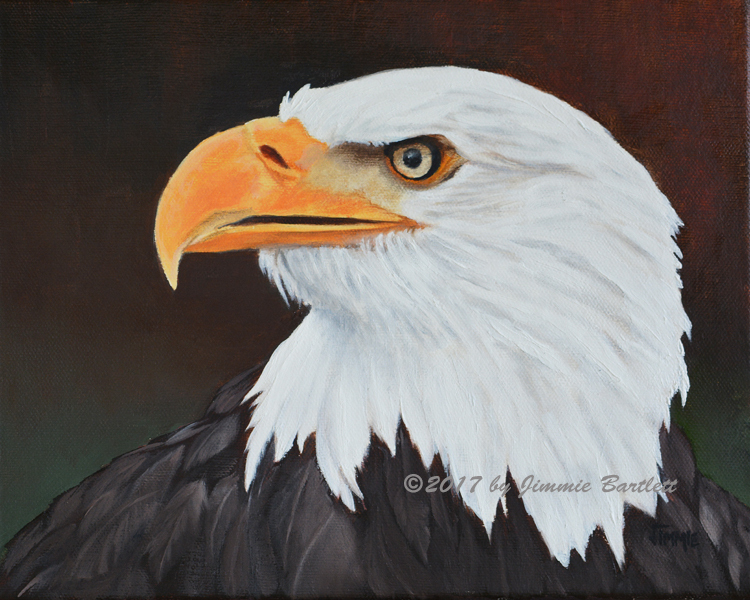 The portrait composition features an American Eagle with his head looking left with emphasis on the eyes of determination. I always enjoy the challenge of the work painting various birds and their distinct features. I am very pleased with the work and hope you enjoy it also. 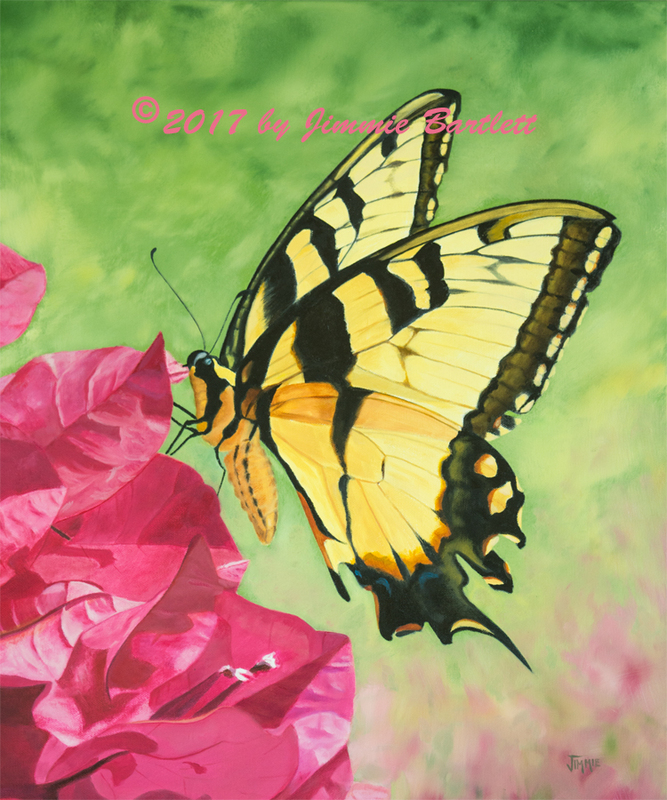 Butterfly on the Bougainvillea is a 24 by 20 inch mixed media acrylic/oil painting on a gallery wrap canvas. The painting is of a butterfly feeding on the flowers in our garden. I painted a small study (6 x 8 inches) of this picture several years back with intentions of a follow up large format painting much sooner than now. The work was done in layers of paint in which the initial first layer and edges was done in acrylics with the remaining layers done in oils. The larger painting is filled with more detail and blends to amplify the colors of both the butterfly and flowers. 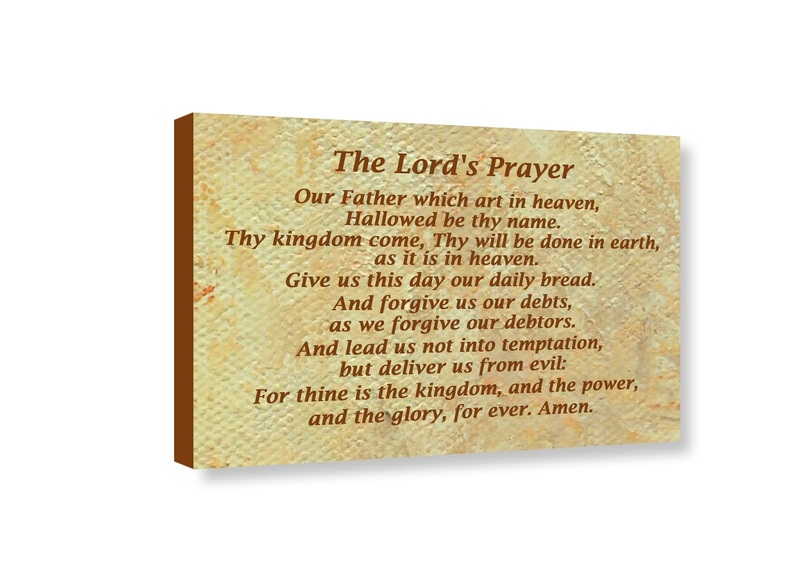 This is a real painting sure to add color and interest for the home or office. I am very pleased with the work and hope you enjoy it also. Girl at the Loom is an original acrylic painting on a stretched 16 x 20 inch canvas. 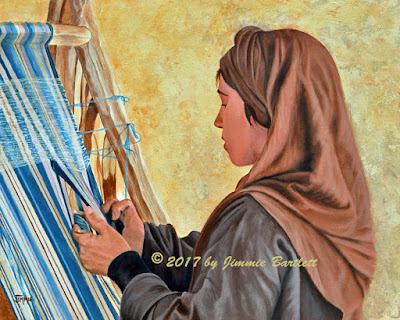 The painting features a mid eastern girl dressed in traditional clothing working at a loom to create a garment. I enjoyed the challenge of the work involved to create this painting. The composition of multiple objects, and a beautiful young girl working the threads on the loom, was very intriguing. The decisions of how detailed I needed to paint to get the result of realistic representation took some effort. 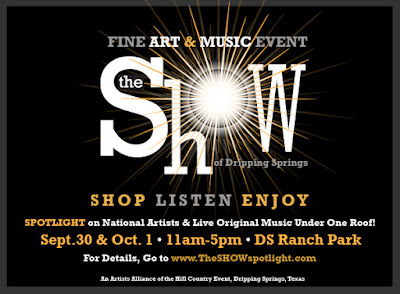 The Show, an Art Show in Dripping Springs Texas! I will be participating in this juried art show and invite all that can make it, to come out and enjoy the Fine Art and Music event. Click on the above flyer to see the artists that are participating. 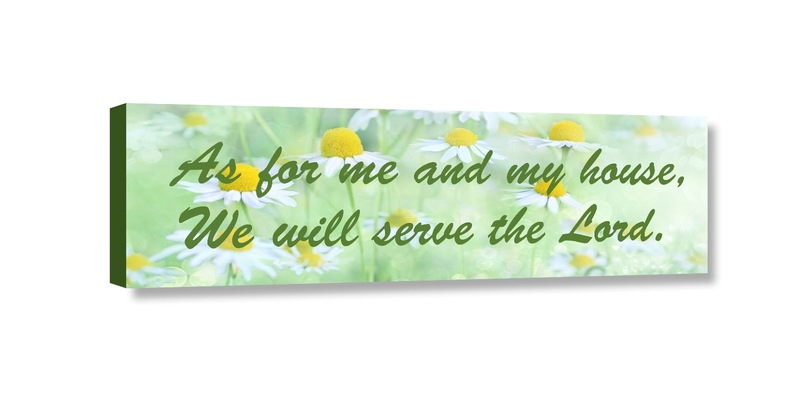 The links to our new website where you can purchase our arts and crafts are at the top of this blog! 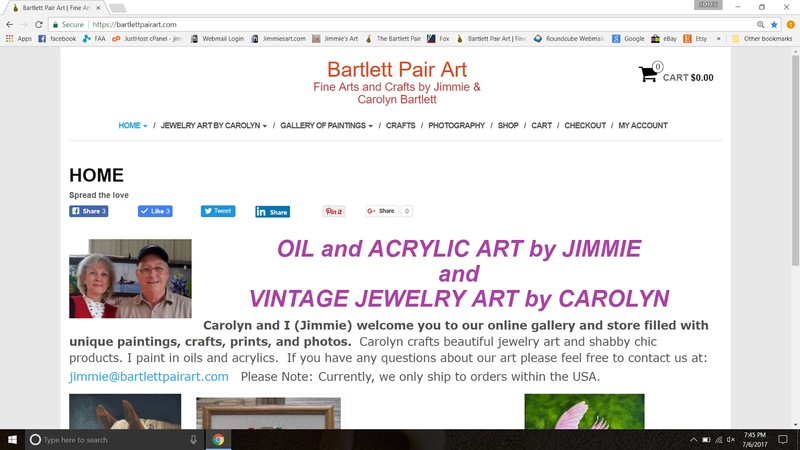 My wife and I have been building a new wordpress website for several weeks and have it substantially populated with our art work products. I decided to go with the word press platform because it is open source and has the ability to use many more features, that I would have most likely had to purchase for site drag n drop builders. 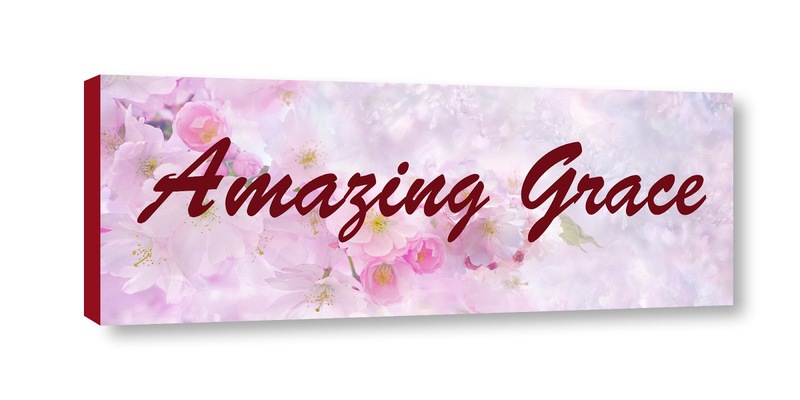 We needed a flexible site for promoting our art/crafts. One with a good platform for content and an ecommerce shop. And, an easy way to promote with social networking. I completed the acrylic painting 'Pelican Splash' today after self critiquing it for two days which included visual in natural light and low light conditions, taking pictures, and running a proof print. I made some final touch ups during the critique and felt good enough to run a 20 x 30 canvas gallery wrap print which turned out great! Next step was to make sure the files were saved. My wife and I were taking pictures of pelicans in Palacios, Texas and was fortunate to get several great pictures of pelicans. I was sitting on the bank of the Tres Palacios Bay taking pics while some fisherman were cleaning fish and tossing the remains in the bay. This big fellow practically flew into my lens hurrying to get a free meal and landed within a few feet of me! 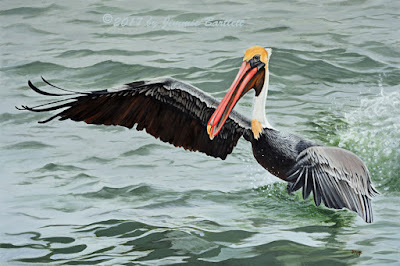 He is an adult male brown pelican and was an excellent specimen to paint. I used my photo reference to get started but for the most part painted him to suit my preferences. Pelican Splash is for sale and prints are available. Please respect my copy rights on my art work. I thank God for the gift and my family for their support. When I was a child, I liked to draw, scribble and make paper airplanes. When I was a kid I liked to whittle out little boats and airplanes. When I was a young boy I played the guitar and tried to sing. When I became a man, I joined the navy, got married, had children, and worked in power plants. 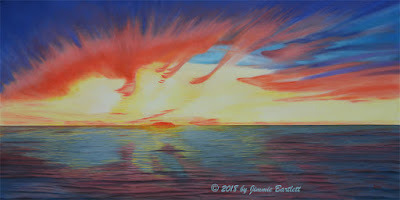 When I finally grew up, I went back to scribbling and found my real passion was to paint. With the gracious support of my wife, painting full time became a reality. For me, painting is a gift from God, and the ultimate release of creativity. I think everyone should try painting at least once in their life. 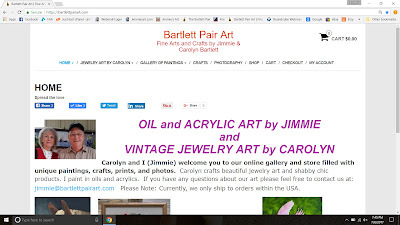 Jimmie Bartlett is the webmaster and author of this blog. Content text, art and images are copy right protected and cannot be legally copied by any method or means, or downloaded off the blog and/or any other websites containing said images without written consent. Prices quoted in blog articles are subject to change without notice and posts may not reflect current price changes. Especially, older posts. Information regarding art processes or technique is for discussion only and cannot be guanteed for any untoward or undesired results. User descretion is advised. Contact Jimmie Bartlett at jimmie@jimmiesart.com if you have questions or suggestions.